One Woman In The Boardroom Isn't Enough. Here's Why. Elizabeth Dolan quit her job as a director at a public company in May. Then, she did something unusual: She told the world why. As the sole woman on the board of the activewear company Quiksilver, Dolan says she faced an unacceptable level of unconscious gender bias, as she described in a June blog post for Fortune and recently reaffirmed to The Huffington Post. Dolan, 57, said that her male colleagues completely shut her out of multiple discussions over whether to fire Andy Mooney, the company’s chief executive -- even though hiring, firing and searching for a CEO are among a board’s most critical jobs. Writing at Fortune, Dolan said she only learned of Mooney’s firing in an email after the fact. She said that four of her fellow directors told her she was “too conflicted” to be involved in the process, because she and Mooney had worked together many years before at Nike. Yet when she was first being interviewed for the board position, Dolan said, the directors had asked her whether she'd be willing to replace the CEO if necessary. "I said yes," Dolan wrote at Fortune. "Like them, I am a businessperson. I understand the tough decisions that we all need to make. I thought my answer had satisfied them. Apparently not." Quiksilver declined to comment to HuffPost. For years, academics and others have warned that you can’t just appoint one woman to a board of directors and consider it “diversified.” But a number of firms seem to have adopted a one-and-done philosophy -- particularly smaller companies, like Quiksilver, and tech startups. Being the only woman on a board can mean you’re treated as the sole representative for an entire demographic -- as in, "Hey Betty, you’re a woman. You think ladies will like our new product updates?" Your actual expertise gets overlooked. A stunning 37 of the companies on the tech-heavy Nasdaq 100 stock index, including Tesla Motors, Priceline and Comcast, have just one woman on the board, according to an analysis conducted this week by HuffPost. Eight other companies have no women at all. And not a single company has a board with at least 50 percent women. It’s worse when you look at the so-called "unicorns" -- that is, private firms with a valuation of at least $1 billion. That list includes Uber, Snapchat, Airbnb and other startups approaching household-name status. 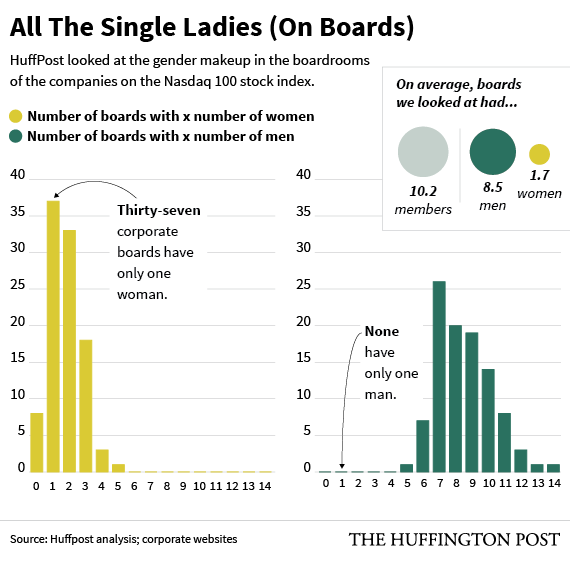 None of them has a board with more than a single woman, according to a recent analysis from Fortune. In a widely cited 2006 survey of 50 women directors and other executives, women who were the only female director at their company said they were ignored in meetings and left out of social activities and “even from some decision-making discussions." Facing criticism a couple years ago, Twitter finally appointed a woman to its all-male board. Just one. That seemed to squash the uproar. These days, the Twitter board is desperately hunting for a new CEO as the company struggles. Not many people are making a big deal out of the board’s lack of diversity. The general theory is that you need at least three women to achieve “critical mass” -- the point at which there are enough women in the group that men stop seeing their gender as the most important thing about them. As Harvard Business Review puts it, once there are at least three women in a group, they "tend to be regarded by other board members not as 'female directors' but simply as directors, and they don’t report being isolated or ignored." We're a long way off from that being the norm. Overall, the percentage of women in the boardroom is absurdly small: Only 19 percent of directors at Standard & Poor's 500 companies in the United States are women, according to research from Catalyst. Indeed, one corporate recruiter told HuffPost that he would have advised Dolan to stay silent, since speaking publicly in the way that she did can be harmful to a company's reputation (and its stock price). Still, Dolan said that she’s been hearing from a lot of peers who are thanking her for speaking up. They've told her they're on the lookout for a new board position for her. Dolan has held executive-level positions since the 1980s, when she was at Nike; she also ran marketing at OWN, Oprah Winfrey's company. Dolan said that going public with her story was something she considered very carefully. CORRECTION: A previous version of this story incorrectly inferred from Dolan's article that some directors on the Quiksilver board were former colleagues or surfing buddies of Andy Mooney. Dolan told HuffPost she was referring to a previous CEO.